NOORIA NODRAT, A SENIOR AT NYC COLLEGE OF TECHNOLOGY, emigrated to the U.S. from Afghanistan in 1991. The Eagle previously reported how, although this woman experienced a series of tragedies both in Afghanistan and New York — including watching the kidnapping of her still-missing brother by fanatics, the bombing death of her husband and a ’97 subway beating that resulted in the loss of her eyes — Nodrat went on to run the New York City Marathon in ‘06. The documentary will premier at Anthology Film Archives, 32 Second Ave. in Manhattan, on Jan. 3 at 8:45 p.m. Admission is $5. In Afghanistan, both her husband and older brother were blind and Nodrat had worked as a proofreader for the Institute of the Blind. Little did she know then how her Braille skills would serve her in her own struggle. In 1997, a drug-addicted teenage girl repeatedly punched her in the head, inflicting such extensive damage that after five surgeries and a painful infection, it was necessary for doctors to remove both of her eyes. Nodrat persevered. She has worked as a volunteer at the Catholic Guild for the Blind and the Jewish Guild for the Blind, offering English as a Second Language training to blind students. As president of the National Federation of the Blind’s New York Student Division, she helps blind high school and college students navigate the higher education system. Her knowledge of computers and technologies for the visually impaired has proven to be especially useful. Nodrat has ambitious plans to create a foundation to help blind women and especially children in Afghanistan, and to assist other organizations that help women and the disabled here and in her native country. This year ROSEMARIE HORNE, a more than two-year survivor of cancer, has taken on the role of the Publicity and Sponsorship Chair for the ’09 American Cancer Society’s Relay for Life (RFL) Committee in Bay Ridge, Bensonhurst and Dyker Heights. Horne was previously active with RFL. On Dec. 10 at Christa McAuliffe, I.S. 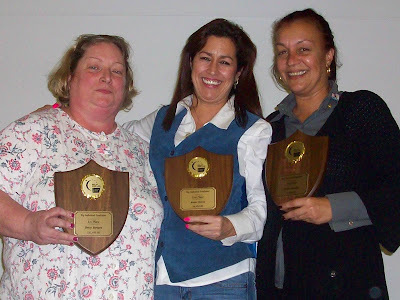 187, RFL hosted its Annual Awards Night and Holiday Party, to celebrate raising more than $162,000 in 2008. Started in 1985 by a volunteer in Tacoma, Wash., there are now 4,800 Relay For Life (RFL) events in the US every year, according to Horne. The Bay Ridge Relay is the largest in NYC and the longest running urban Relay in the country. IN MANY WAYS, BUSHWICK RESIDENT JUNE MORIS is a musican’s musician, yet her lyrics open their arms to all. Moris has built her life as a singer/songwriter, producer and instrumentalist. “Music is part of my daily needs,” she says. Inspired by Chopin and classical piano in her youth, she later experimented with electronic music. Now Moris constructs meditative, basic structures and layers them into what she calls “Hypnotic Wave.” The concept combines ‘80s darkwave, folk music and trip hop. The intention is to “alter consciousness.” When this happens, according to Moris, both mind and body are free to dance. Moris’s earlier electronic pieces sparked radio play and led her to several festivals in the NYC club circuit and around the country. She was then hired to write a piece for Dutch painter H. Van Goethem and a piece for a Rorschach tribute. Her vocal style has been compared to Alanis Morissette and Bjork. “White Spot,” her seven-song EP, was released in fall 2008 and is available on Amazon, Itunes and various music websites. Currently, she is recording two full-length albums and is aiming for summer 2009 as a release date. The Brooklyn Designers Showcase, a five-year shopping staple of the Heights, will have its last day of the year on Dec. 20 at Church of St. Ann on Montague Street. Items, including Irene’s Secret handmade lotions and soaps made by IRENE MCKENZIE, handmade clothing under the name In Sharon’s Closet by SHARON MCKENZIE-STUKES and stained glass window treatments made by EDWARD HARMAN, will be for sale from 11 a.m. to 5 p.m.